When Jon Littleford went hunting for a new house in Portland, the top criteria was a detached garage big enough to design and build custom bikes. A bike traveler with a background in both aerospace and fine art painting, Jon dove into frame-building three years ago. 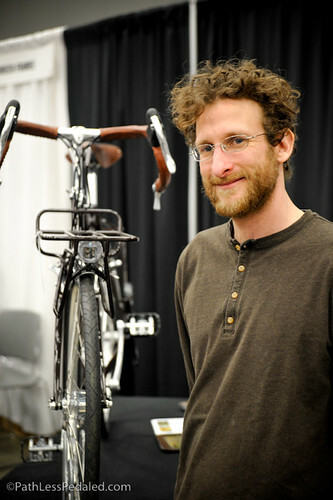 When you look at the details of his NAHBS show bike, you see his enthusiasm for self-supported bicycle travel and lessons learned from the road. 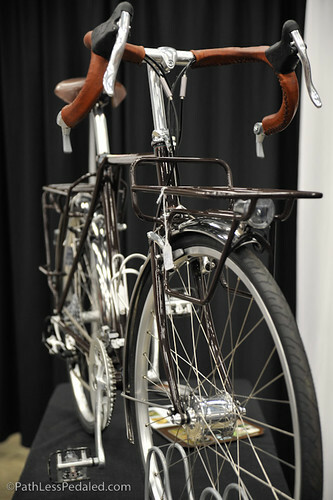 The front rack is constructed with a wide top platform and lower rails from which to hang panniers. It’s designed so that the panniers lean into the bike, reducing wind-resistance. The rear rack has an integrated u-lock holder, out of the way of the placement of any rear bags. The contact points, where the front and rear racks meet the frame, are stainless steel, so that the paint doesn’t chip off over time. The brake cables are routed internally, as is the wiring for the front and rear dynamo-powered lights runs. But the wiring from the front to the rear light is spliced at the fork, making it possible to disassemble the bike if ever needed. He intentionally made the decision to utilize easily-replaceable components. Shimano’s most popular shifters, he points out, so that you can find replacements anywhere. And the fenders? Shiny, yes, and sturdy. They’re mounted in three places, and they should never crack. There are a lot of obviously-thoughtful design decisions in this bike, and Jon doesn’t hesitate when asked if they come from his bike travel experiences. “R & D trips,” he calls his bike tours, a chance to test out new ideas and brainstorm. We can only wonder what inspiration will return with him after his upcoming trip to Madagascar. 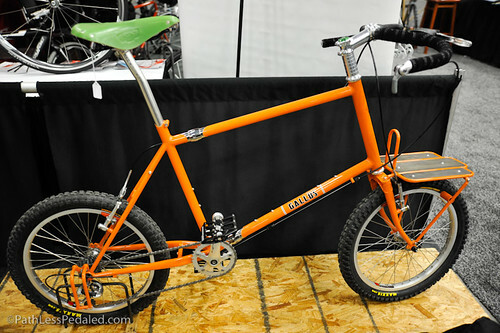 The “Travel Grinder” by Gallus Cycle’s Jeremy Schlachter is an enigma wrapped in a puzzle. 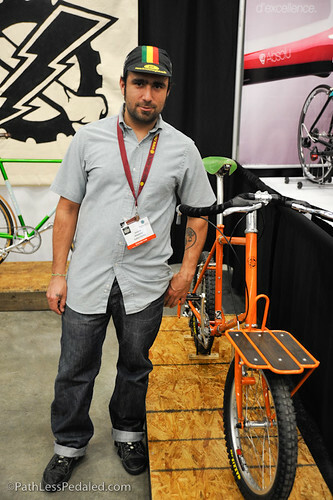 Based in Fort Worth, this is Jeremy’s first year participating in NAHBS, though he has shown bikes in other regional bike shows. Part monster truck and part travel bike, the Travel Grinder is an attempt to “bridge bikes on the opposite spectrum of design.” It is a 20-inch all-rounder bicycle that is designed to ride on the road as well as to hit the dirt. Though not designed for super technical runs, it can hold its own on mixed terrain. Jeremy studied several mini bike models from Dahons, Bike Fridays to Bromptons. For his purposes, he decided the diamond frame gave him the stiffness he was seeking in a bike. A lot of the design work was spent fine tuning various angles to create the right trail so that the ride wouldn’t have the associated “twitchiness” of some small wheel bikes. The bike is optimized for travel. The Travel Grinder is equipped with SS couplers for easy disassembly. The mini front rack is also designed to disassemble and flat pack into a case. The Travel Grinder promises to deliver a solid ride on both asphalt and mixed terrain that you can take anywhere. t is probably only in NAHBS where you can accidentally run into the illustrator/designer of many of Rivendell’s bicycle headbadges and decals at the bike valet. Six days later, Jon got a call and he was on his way designing head badges and decals for Rivendell. He has gone on to do the illustration work for the Wilbury, Glorius, Rambouillet, Bleriot, Proto-Velo and Ressurectio. 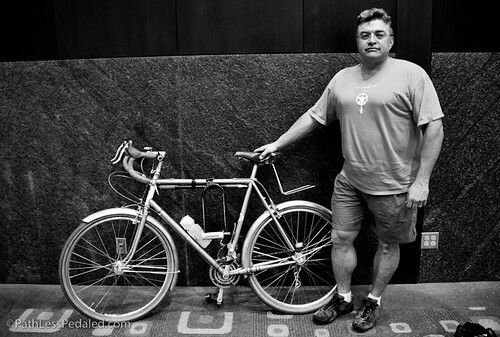 When we met Jon he was riding a Bleriot with steel fenders and Grand Bois tires. Although he admits that Rivendells may not appeal to everyone and that Grants views can be sometimes controversial, of the thirteen bikes in his stable, his Riv is his favorite.